BMOTA Vertical team, along with members of the Out Islands Promotion Board, Association of Bahamas Marinas meet with the organizers for the 2018 FLIBS at Informa, pictured left to right are: (seated) Greg Rolle, Sr. Director, Sports & Vertical Markets, BMOTA; Robert Correa, Vice President, US Boat Shows; Ellison “Tommy” Thompson, Deputy Director General, BMOTA; and John Nigro, Director of Operations, US Boat Shows. Standing from left to right are: Donna Ash, BMOTA; Basil Smith, Executive Director, ABM; Kerry Fountain, Executive Vice President, OIPB; Carlton Sands, BMOTA; Richard Treco, BMOTA; Sabrina Huyler, BMOTA; Adriana Suao, Vice President, Tambourine; Scott Young, Tropic Ocean; L’Oreal Sweeting, OIPB; Dean Fillichio, Business Development Manager, Informa; Nikki Sollomon, Digital Marketing, Informa; Leonard Stuart, BMOTA; Andre Miller, BMOTA, Lana Bernstein, Vice President of Marketing Informa and Richard Sturm, Sales Rep, Informa. PLANTATION, Florida – The countdown is on for the 2018 Fort Lauderdale International Boat Show (FLIBS) and The Islands Of The Bahamas will have an exclusive and even greater presence at this year’s show, being held October 31 through November 4, 2018. Now in its 59th year, the 2018 FLIBS is expected to attract more than 100,000 persons from 52 countries around the world and will showcase more than 1500 in-water boats and 1200 exhibitors. The Bahamas will have an impressive presence at this year’s show. Its new 800 square feet branded booth will include the first and newly released digital video wall from the Bahamas Ministry of Tourism and Aviation (BMOTA) and will geo-target The Bahamas’ vertical markets: boating, fishing, diving, and aviation. 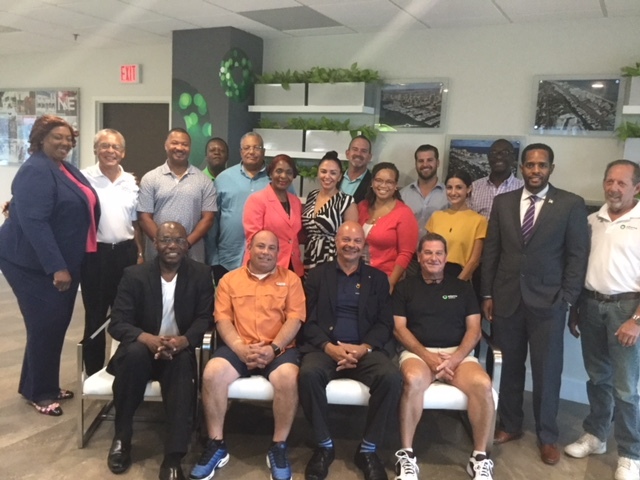 Several of The Bahamas’ leading industry partners including representatives from the Out Islands Promotion Board, Association of Bahamas Marinas as well as Bahamasair, Atlantis Marina, Bay Street Marina, Bluff House, Highbourne Cay Marina, Hope Town Inn and Marina, Odyssey Aviation, Palm Cay Marina, Port Lucaya Marina, Resorts World Bimini, Romora Bay Resort and Marina, Staniel Cay Yacht Club, Watermakers Air, Treasure Cay Beach Hotel and Marina, Valentine’s Resort and Marina, Tropic Ocean Airways and the Chat n Chill Bar and Restaurant will also be featured inside The Bahamas branded booth. In addition, Colors Junkanoo Group will kick off the opening ceremony at 12 noon on October 31 with a fully costumed, musically charged performance and will usher in attendees and lead them to The Bahamas’ prime, centralized booth for a full Junkanoo rush-out. 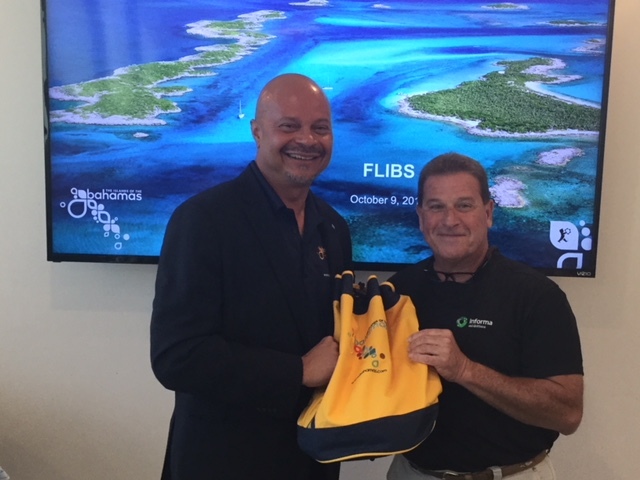 Deputy Director General of the Bahamas Ministry of Tourism, Ellison “Tommy” Thompson, makes a special presentation to organizer of the 2018 FLIBS, John Nigro, Informa Director of Operations, US Boat Shows. According to John Nigro, Informa Director of Operations, U.S. Boat Shows, his team along with organizers for this year’s show expect that FLIBS 2018 will be the biggest and busiest show yet. “Some 15 miles of floating docks and 3 million square feet of exhibition space is being built to accommodate the more than110,000 persons expected to attend the five-day event. We are especially pleased to be working with the BMOTA team and excited about the impact The Bahamas presence and culture will bring to show goers,” he said. “Boating is one of the most important business areas of tourism for The Bahamas and we have seen a substantial growth in this area, over the past year,” said Ellison “Tommy” Thompson, Deputy Director General at the BMOTA. “We are so excited about the level of prominence The Bahamas has been given at this year’s show, which we know will impact us in a very big way. We are ready for the expected high level of traffic, business leads and residual spinoffs this show will provide to The Bahamas, its vertical markets and our industry partners,” he said. Throughout the show, the BMOTA vertical team will capture data and generate leads from registered participants to use in special promotional campaigns and for future business. A complimentary Bahamas experience and getaway prize will be awarded daily to a lucky visitor who has registered at The Bahamas’ booth.